To create a portrait of an individual—movie producer Robert Evans, say, or musician Kurt Cobain—director Brett Morgen abides by an austere tenet. "I don't start working on a film until we have collected every single piece of media in existence on a subject," Morgen reveals. "That's when I know it's time for me to go to work." The approach may sound tortuous, but it can make the difference between a good film and a definitive one, as in the case of Morgen's 2015 documentary Kurt Cobain: Montage of Heck. "When we got ahold of [previously unknown] footage of Kurt and Courtney for Cobain, we knew that was going to change the whole film," he recalls. "It's like being an archaeologist. You unearth something and sometimes there is the pure joy of seeing something nobody else has ever seen." The archival portrait is by its nature a character-driven film. The task for the filmmaker is to uncover those moments that reveal the subject in sharpest detail—a fleeting look, the telling comment that speak volumes about a person, obviating the need for a narrator's explanatory track. For his Oscar-winning portrait of the late music artist Amy Winehouse, Asif Kapadia drew from a vast array of material, from answering machine messages to amateur video shot by her friends. Footage of a young Winehouse at a birthday celebration helped illustrate her precocious vocal talent. "The first scene, when she sings 'Happy Birthday,' she's got the voice, she's just different, she's different to everyone around her," Kapadia recalls. "She has a phrasing and a way of singing—even the best-known song in the world, she could do her version of that at age 14." Nina Krstic, archival producer for the Oscar-winning O.J. : Made in America, faced a monumental challenge as she began work on Ezra Edelman's 467-minute-long portrait of O.J. Simpson and his times. "Obviously the O.J. story has been covered and covered and covered to death," she notes. "[But] that very much appeals to me, which is to take something that everybody thinks they know and shed new light on it and show new footage and show new angles." She adds, "I particularly concentrated on finding raw interviews; those little moments in between, when he's not sure the camera is on and he's checking his makeup—those are really these tiny magical character moments that speak so many words and really speak to his character a lot more than an interview that he's prepped for. He is a media personality, so there is a wall there." Krstic recalled finding one particular gem that hadn't been seen for decades. "I basically stumbled upon an art gallery flyer in an old newspaper from the '70s, and it was advertising a multimedia art show in Buffalo [New York] about O.J. Simpson. I ended up finding the artist and [learning that] he [had] filmed this 45-minute interview with O.J. It was one of the more unfiltered interviews that O.J. has ever done. It really brought a lot to the film." For her work on the documentary, Krstic won Researcher of the Year at the FOCAL International Awards, presented by the Federation of Commercial Audio Visual Libraries. Indeed, the research process behind O.J. : Made in America called for consulting libraries far and wide. "Some archives are specialized, some are not," she explains. "When you first start a project, you just to try to get a very broad picture of who has what. You go find personal archives as well and people who shot things themselves and just happen to have the footage. We reached out to a lot of Los Angeles news archives; with LA being such a major character, we had to get that footage right." For their portrait of President Ronald Reagan as media entity in The Reagan Show, directors Sierra Pettengill and Pacho Velez headed north of Los Angeles. 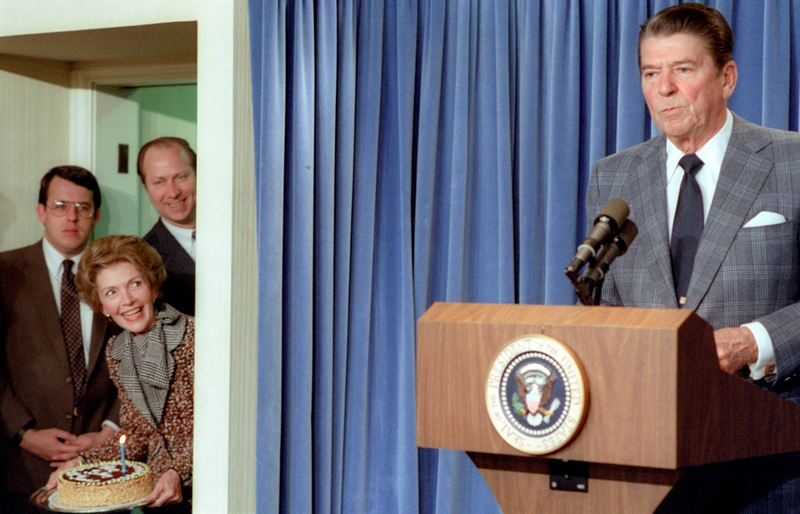 "It started with his television archives that are held in the Ronald Reagan Presidential Library in Simi Valley, California," Pettengill recalls. "We as a team watched through what came to nearly a thousand hours of footage from the archive." To capture the performative nature of the Reagan presidency, they seized on examples through the years where Reagan would voice the same line—like the Russian proverb, "Trust but verify." "By going to these repeated moments they build on each other and quote each other," Pettengill observes. "The audience becomes familiar with a kind of trope now." Velez adds, "When you see how many times he says it, how he does it with the same inflection each time, how he uses it in all sorts of situations both where it's applicable and it's inapplicable—you montage them all together in the edit and suddenly it starts to mean something." Velez notes that The Reagan Show marked his first time working extensively with archive. "I realized archival footage ends up always being really authored in the sense that it maintains some signs or some inscriptions of its original intent," he asserts. "It bears marks of its original purpose, as well as the new uses towards which we're putting it. In this way it exists in the film as a kind of double image. That separation between its original meaning and the sort of re-contextualized meaning is a lot of what energizes archival filmmaking." Morgen was conscious of a similar dynamic in making his latest documentary, Jane, a portrait of the primatologist and conservationist Jane Goodall. He drew upon 140 hours of film from the 1960s that documented Goodall's research on the behavior of chimpanzees in the wild in Gombe, Tanzania. The material was originally recorded for National Geographic by Hugo van Lawick, a filmmaker who later became Goodall's husband. "One of our biggest challenges was to take this footage shot for this other aesthetic purpose and repurpose it in a manner that was never intended, which is to create an immersive experience," Morgen explains. "That then is achieved through editorial. By taking the same shots and juxtaposing them in a different manner, we were able to liberate them, in a sense." Morgen also spent endless hours color-correcting the source material. "People seem to think that's what the [original] film looks like. That was not what the film looks like. The density of the film was obviously terrific, but there was some color degradation. More importantly, the palette in 1962 is quite different from the palette today. And in trying to make a film that would feel immediate, we definitely used a more contemporary palette. "We have to color-grade [source material] to make it our own," Morgen continues. "Color grading is of as much value as sound design or editorial, as any aspect of archival filmmaking. I think this is really an underestimated tool in our medium." At the outset of Jane, Morgen confronted a major obstacle—the archived film had been stored in haphazard fashion. "Of all the hours we looked at there were no two consecutive shots in order on a reel, meaning we had 140 hours of random shots with no sound, featuring 160 chimps that didn't have name tags, of which only four were relevant to us," he recalls. "It took about eight months of work to organize the material by theme." Organizing material proved critical to Pettengill and Velez on The Reagan Show and Krstic on O.J. "It's one of those topics that most people don't want to talk about, but I think it's extremely important," Krstic asserts. "My mantra has always been, If the editors can't find it in their system, it might as well not exist." She says FileMaker software aided her. "I built a semi-complex FileMaker database and then I logged, interns logged, the PAs logged, the researchers logged…and they've all hated me for it," she laughs. "But it's time well spent. Towards the ends of the project, as the editors were looking for extremely particular shots—like 'Johnnie Cochran smiles and turns his head to the right,' for example—we were really able to use our FileMaker database to find those kinds of shots, which saved countless hours." Keeping close tabs on archive footage plays into another vital component of the filmmaking process: clearances. O.J. : Made in America includes substantial amounts of raw news footage, all of which had to be licensed. "Just the sheer volume of stuff like that we had in this film, it almost brought me down," Krstic admits. Pettengill and Velez consulted legal advisors, who provided guidance on licensing and the documentary filmmaker's indispensable ally—fair use. "We really worked very closely with lawyers from the beginning, all the way to the end. We sketched out what we were looking to do and talked through how that could proceed," Pettengill recalls. "That was a pretty crucial part of the creative process, actually. We could make sure we were prioritizing the shots that were really important to us financially and legally." What advice do these filmmakers have for anyone who plans to embark on an archive-driven film? "Turn around," Krstic jokes. "My number-one piece of advice to producers creating budgets is to allow for the archival producer to start at the beginning with everybody else. I was allowed the time to do my job. And it's not a fast process. You have to allow time for deep research or you're not going to do your film justice." Velez and Pettengill offered a practical tip. "The archival filmmaking process is one that involves being at a desk editing for a set of long years," Pettengill notes. "Make sure you take care of your wrists and back. Take some nice walks." Morgen cites the need for a philosophical framework to keep in mind. "The archival footage serves the truth. It doesn't create the truth—it's there to serve it. So you have to know what the truth is you are trying to convey, and then find the images appropriate for it. So you see, one comes before the other." Matthew Carey is a documentary director and producer whose work has appeared on CNN and CNN International. He is editor-in-chief of Nonfictionfilm.com.